Lock base: 15/16" x 2-5/8"; strike: 5/8" x 2-5/8". Easy-to-install, extruded aluminum housing with steel screw to securely lock window in closed or ventilating position. 1"L x 7/16"H. Economy sliding window lock with single thumbscrew and no-mar rubber insert to help prevent marring on window frame. Extruded aluminum housing with cam action. Securely locks window in closed or ventilating position. Added security when staying in a hotel. No tools needed to install. Prefix U on factory number denotes new Defender Security packaging. 1-3/4"L x 11/32"W x 5/8"H. Flip lock mounts on vertical track, stops window in vent position. Wedge flips out of the way to avoid opening. Includes 2 locks and installation screws. Draws window frames together to reduce rattle. Crescent type lock is for double-hung windows. Mounting screws included to match product finish. Mini-pack bagged. Used on vertical and horizontal sliding windows. Does not use keepers, latch engages fixed rail to lock. Includes 25/32"W x 2-15/16"L lock, and 2 installation screws. 2-1/4" hole centers. Used on vertical and horizontal sliding windows. Does not use keepers, latch engages fixed rail to lock. Includes 25/32"W x 2-15/16"L lock, and 2 installation screws. 2-1/4" hole centers. Spring-loaded vinyl tilt latch; used on single or double-hung, aluminum or vinyl windows. Use in sash panels designed to tilt in and down from top of window. Includes 1 left hand latch; 1 right hand latch and 1 set of screws. Draws window frames together to reduce rattle. Crescent type lock is for double-hung windows. Mounting screws included to match product finish. Mini-pack bagged. Draws window frames together to reduce rattle. Crescent type lock is for double-hung windows. Mounting screws included to match product finish. Mini-pack bagged. Draws window frames together to reduce rattle. For double-hung windows. Mounting screws included to match product finish. Bagged. Spring-loaded vinyl tilt latch; used on single or double-hung, aluminum or vinyl windows; for use on sash panels designed to tilt in and down from the top. Contents: 1 left hand latch; 1 right hand latch; 1 set of installation screws. Designed to provide ventilation for all wood, double-hung and sash windows. Catch slides over when needed and slides out of the way when not needed. Decorative strike provided to prevent window damage. Steel body and strike. Visual-pack. Fits aluminum, vinyl, or wood double hung windows. Includes 25/32"W lock, 5/16"W keeper, and set of installation screws. 2-1/4" hole centers. Used on many double hung windows. Includes lock, keeper, and set of installation screws. 5/8"W lock and keeper bases. 1-15/16" hole centers. Cam action sash lock universal design. Stamped steel construction. Includes lock with keeper and installation screws. Multiple hole center. Prefix U on factory number denotes new Defender Security packaging. Heavy-duty extruded aluminum lock with single thumbscrew; includes removable round plastic wrench for ease of operation and added torque when tightening or loosening thumbscrew. For installation on metal horizontal sliding windows; securely locks window in closed or ventilating position. For a non-marring lock see U-9820, U-9821 and U-10551. For vinyl windows use U-9809 or U-10547. 1/4"H x 1"L.
Heavy-duty extruded aluminum lock with single thumbscrew; includes removable round plastic wrench for ease of operation and added torque when tightening or loosening thumbscrew. For installation on metal horizontal sliding windows; securely locks window in closed or ventilating position. For a non-marring lock see U-9820, U-9821 and U-10551. For vinyl windows use U-9809 or U-10547. 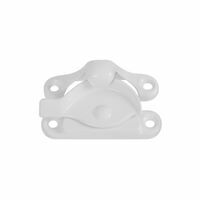 1/4"H x 1"L. National Hardware Sash Lock, Crescent, Rigid, Series: V600, Suitable For Use With: Double-Hung Windows, Die Cast Zinc, White, 1.68 in Overall Length, 2.45 in Overall Width, 0.62 in Overall Depth, Includes: Mounting Screws Draws window frames together to reduce rattle. Crescent type lock is for double-hung windows. Mounting screws included to match product finish. Mini-pack bagged. Draws window frames together to reduce rattle. For double-hung windows. Mounting screws included to match product finish. Visual-pack. Cam-action sash lock; universal design; stamped steel construction. Contents: 1 sash lock; 1 keeper; 1 set of installation screws. 1-7/8" Hole centers. Sash lock with child safety lever. Zinc alloy material. Screws included. Sash lock with child safety lever. Zinc alloy material. Screws included. Draws window frames together for a tight seal. Cam-action sash lock is for designed to lock and draw tight double-hung or sliding windows. Mounting screws included to match product finish. Cam-type action, with alignment lugs. used on vinyl framed windows. Contents: 1 lock, 1 keeper, 1 set of installation screws. Diecast construction. Baked enamel finish. Used on aluminum or vinyl windows. Alignment lugs prevent shifting of rails during locking. Includes lock, keeper and installation screws. Draws window frames together to reduce rattle. Crescent type lock is for double-hung windows. Mounting screws included to match product finish. Mini-pack bagged. Draws window frames together to reduce rattle. Crescent type lock is for double-hung windows. Mounting screws included to match product finish. Mini-pack bagged.